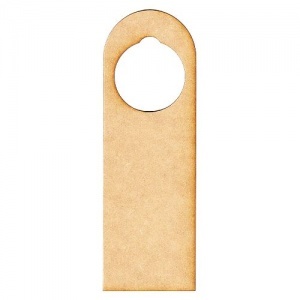 Rectangle shaped door hanger comes with a rounded shaped top and measures approx 240mm x 80mm. Laser cut from 2mm MDF. Door hangers can be decorated for just about any season and for any room of the house, craft room, workshop or shed! Hang from door handles, cupboard knobs or pegboards to add a dash of creativity to any setting. Paint, collage, stamp and embellish - ideal for personalised gifts or craft fair makes.